Recently, my nephew Rupankar, niece Rashmita and I were exploring the city of Yangon, in Myanmar (formerly Burma), a South-East Asian country, opened to the travelers only a few years ago, being under military dictatorship for last several decades. 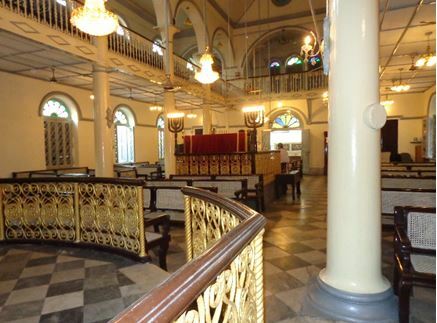 At one point, our local guide mentioned to us about the existence of a historic Jewish temple of prayer, namely the Musmeah Yeshua Synagogue in the city, being also the only synagogue in the entire country. We thought the place might reveal some fascinating Jewish history in this now predominantly Buddhist country and included in our itinerary. Thus, one day we followed the tour guide through a busy section (known as the Little India) of the central market to a simple-looking building. 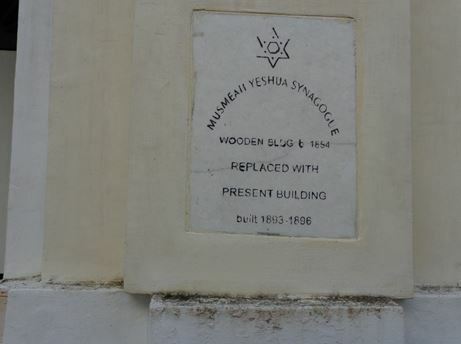 A marble plaque, adorned with a Jewish Star of David on the wall at the entrance, notified us that the current place was built between 1893 and 1896, replacing an earlier wooden structure built in 1854 (Image 1). Seeing us from inside, a bespectacled gentleman came out and introduced himself as Mr. Moses Samuels, one of the remaining handful of Jews in the city as well as the caretaker of the place. He kindly offered us a tour of the temple. Entering the building, we were dazzled by the beauty of this ornate place with its sanctuary (main place of worship) and a second-floor balcony with arches. 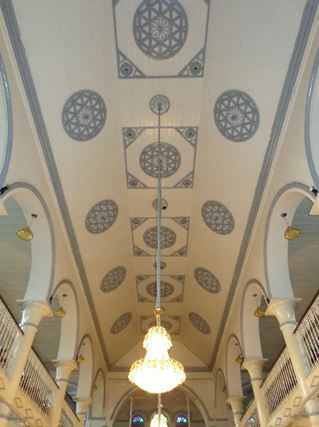 Looking overhead, the decorated roof from where chandelier-like decorative lights were hanging came to our view. Inside the main sanctuary, a gilded menorah to hold candles on holidays was placed on a velvet covered furniture honoring the memory of a past member. At our request, Mr. Samuels narrated some historical background of the place. During British Colonial era in then Burma, a migration of Baghdadi Jews from the Middle East to Yangon (known as Rangoon at the time) took place. Subsequently, the Jews from Cochin in India also arrived here. In order to meet their need for a place of worship, the community was allowed to build its first synagogue. Mr. Samuels then directed our attention towards two historical ceremonial decorated silver cylinders. 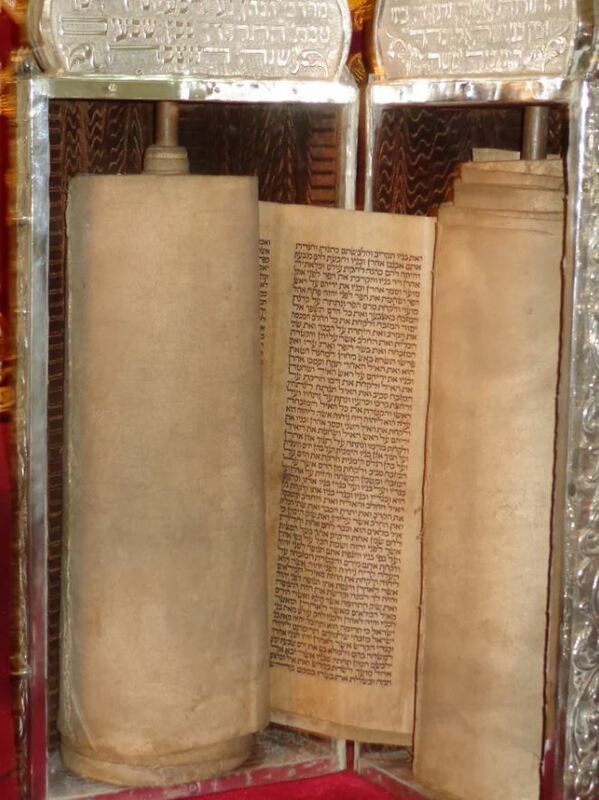 Afterwards, he opened a chamber on the wall of the synagogue for us to see, standing at a distance, the synagogue’s collection of the Torah (Jewish Bible). Later, we visited an adjoining museum space where we noticed several historical artifacts as well as several ancient Jewish narratives about the role of a synagogue both as a prayer place as well as a gathering place for the community. The serendipitous discovery of the synagogue offered us a unique historical perspective of the Jewish people and their practice of the religion in this faraway land from modern day Israel.